They say the future is wireless, but unfortunately we still live in the present. Phones, tablets, and laptops are all charged using cables, and it seems that you can never have too many USB Type-C cables lying around. 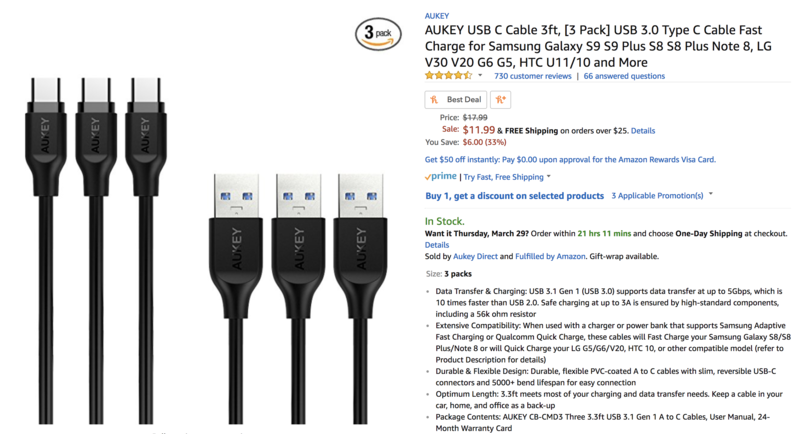 Luckily, Slickdeals has spotted a great deal for three Aukey USB A to USB C cables with a coupon code that'll save you 42% off the already discounted sticker price of $11.99. The Aukey cables are specified as USB 3.1 Gen 1 (formerly known as USB 3.0), meaning they can handle data transfer speeds of up to 5 Gbps. They are 3.3 feet long and can charge at up to 3A, and support both Samsung Adaptive Fast Charging and Qualcomm Quick Charge (when used with a compatible battery pack or charger). They don't support quick charging on devices such as the Nexus 6P or Google Pixel 2, so you may want to bear that in mind. To take advantage of the deal, just head over to the Amazon page and insert the code MBYXI7AJ at checkout. Your never-ending collection of cables will appreciate it.